Share Josh’s resources in the Middle East and North Africa! Provide ministry partners with the Christ-centered resources they need to proclaim the gospel in closed countries. The safety of Christians in the Middle East is so uncertain. That’s why we need to stand with believers in this dangerous region. Christians from a traditional Middle East religious background — we call them truth seekers — often experience the worst oppression. Many have no choice but to keep their faith a secret from family and the community around them. Simply investigating the claims of Christ can cost them their job, inheritance and the right or means to marry. Openly accepting Jesus means harassment and sometimes even violence. That’s why we need to stand with Christians there AND support our ministry partners who are working so hard to evangelize and disciple truth seekers. God’s Word calls us to stand with those who endure persecution, remembering them as if we ourselves are suffering (Hebrews 13:3). As instability increases all across the Middle East —and it will only continue to increase — your support for our ministry partners there will become even more crucial. Your gift now will share Jesus with people not only in the Middle East but also in North Africa, by providing Christ-centered resources for ministry work, including follow-up and discipleship resources for radio programs. After one of our programs ended, the phone rang. 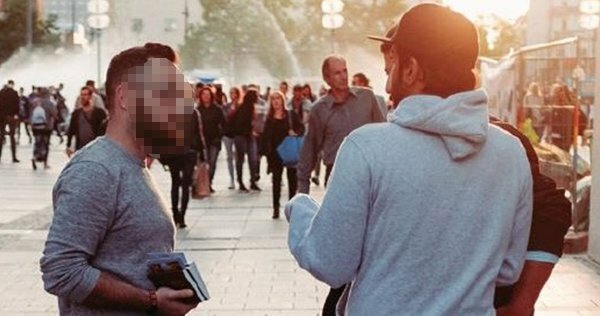 A man named Fadhil (not his real name) requested a Bible. We told him that we would arrange for someone to deliver the Bible to him. That’s a pretty amazing story. And it shows the desperation among people who want to finally know truth but realize they’re being watched by their family, community and government. These truth seekers need your support — now more than ever. They’re being watched, threatened and harassed. Christian churches are being burned, homes looted and leaders killed. But you can come alongside our ministry partners in the Middle East and North Africa and equip them to share the gospel. So please give now! Your gift will be such a blessing to someone like Fadhil, who is considering taking a huge risk to follow Jesus. Thank you. And God bless you.